Sometimes, I think he says it as an excuse to visit Home Depot. The same argument never seems to apply when I want a new kitchen gadget, haha! 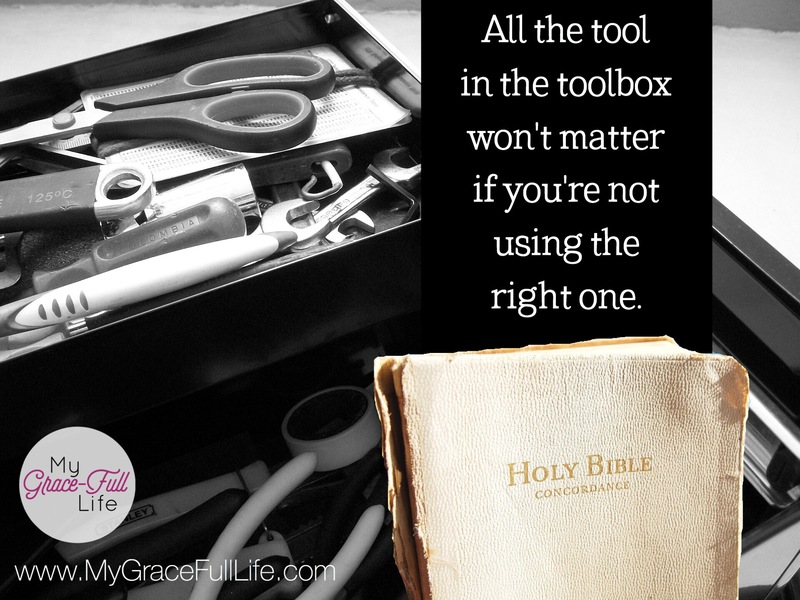 We go through life looking for all kinds of tools to help us make life easier. The self-help book market is a billion dollar industry and it grows each year. And speaking of weight, it’s no secret that weight loss programs and supplements are its own separate billion dollar industry. We are a group of people who are looking for a quick fix and we’re willing to pay for it. But what we fail to remember: the solution has already been paid for. The solution we seek to fill our souls came to earth 2000 years ago and He paid our sin debt when He died on the cross. No self-help book or weight loss routine can come close to delivering what Jesus Himself has offered us – eternal life. It doesn’t matter how many books are on your shelves or how many workshops you attend… all that matters is faith in Christ. It doesn’t promise an easy life and anyone who says otherwise isn’t preaching Biblical truth. We live in an imperfect, sinful, sin-filled world. No self-help book can erase that! But as Christians, we don’t live for this world. And the only tool we need is the Bible. The Bible is the tool that guides, directs, counsels, comforts, grows, humbles, inspires, and brings us closer to God. It’s truly the only all-in-one tool. Today, as you pray, ask Jesus to remind you to seek Him before you seek help anywhere else. Ask The Holy Spirit to whisper words of scripture to your heart when you need guidance. And pick up your Bible. Make it your daily go-to tool for all you need.